Smartphones have become the standard for on-the-go communication – in just about every form. As a result, the demands for infrastructure which supports mobile devices has grown immensely. Sprawling webs of cables, fiber optics, and antennas adorn rooftops and towers alike to make sure users can remain connected. 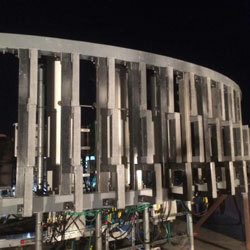 In this application, one of the largest cellular providers in the U.S. needed to replace a metallic radius screen wall. 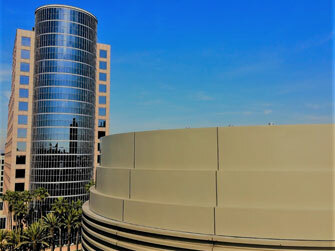 One issue with this particular cell site is its prominent location in an office building near LAX in West Los Angeles. In addition, the concealed structure possesses a radial curve. For the unique needs of this project, Porter FRP presented a lightweight fiberglass solution which completely concealed the cellular system while adding architectural flair. The owner of the building requested limited use of heavy machinery so as to minimize disruption to building occupants. The products used were EXTREN® 4" x 1/4" tube, 4" x 1/4" angle, and 1/8" plate. All of which are LARR (Los Angeles Research Report) approved. pleased with the overall outcome.